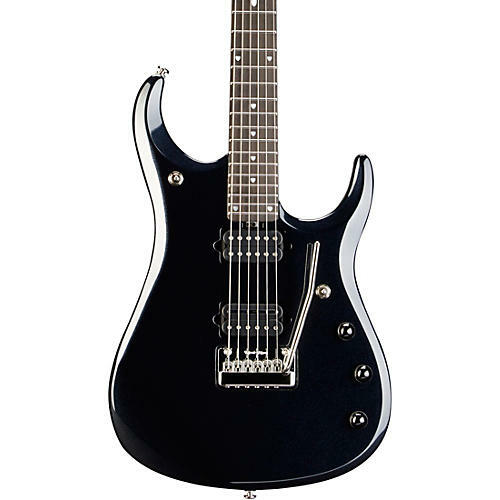 The JPXI-6 is the newest collaborative effort between John Petrucci and the Music Man R&D team. The JPXI features a combination of top appointments from JPX and BFR Petrucci signature instruments. Most notably, the JPXI neck has been streamlined to a symmetric, extra slim profile featuring a flatter 20 in. radius, medium jumbo stainless steel frets with a finished mahogany neck and an ebony fingerboard. This, combined with the non-chambered body, mahogany Tone Block and maple top, has become the ultimate rock machine. The controls are similar to that of the JP BFR line, with 2 three way toggles perfectly wired for the Custom Dimarzio LiquiFire and Crunch Lab humbuckers, as well as the Piezo bridge pickup. The JPXI-6 is adorned with chrome hardware, Mother of Pearl inlays and a new Onyx finish. Includes case.